Loom beadwork is fast way of getting results particularly for bracelets. Like a lot of hand crafts, the repetitive action loom beading is soothing. The looms though are usually tabletop affairs and hardly the kind of tool to pack when on the move. But a hugely popular and innovative loom changed all that back in 2013. It is so small and portable, you could pop it into your and take it with you on vacation. I spotted the tool some time ago and bought it because of its great potential for both bead and wire work. The Jewel Loom is incredibly cost effective. This kit via Amazon includes the loom, needle, threader and pouch costs just $11.50! The flexible design is ingenious. The metal bar is slotted into the 2 holes of the loom. This makes the loom curve more. The warp threads are set up and tied around button like pegs at the back. When the metal bar is removed, the loom straightens and in the process makes the warp threads taut. The inventor of the Jewel Loom is Julianna Avelar of Casa De Jewels. I recently received her new book Jewel Loom Inspirations for review. It is published by Fons and Porter/F+W. The 17 projects in the book teaches not just how to use the tool but showcases many ideas to try. They are all indeed quick and fun projects for all levels, aged 12+! Some of the projects like the middle picture in the contents use leather cords as the warp “threads”. Many of the bracelet projects showed how larger beads can be used instead of the typical seed beads. The 2-hole tile beads used for the Checked Cuff below will really speed up the design. I liked how the designer showed alternative ways to easily finish the ends. Ribbon clamps (as below) or box clasps are used. The leather cord designs were finished with button clasps. Another great idea in the book is to use the seed bead loom work as the foundation for more elaborate designs like the Ocean‘s Desire bracelet below. I would have never considered using the loom for beaded rings until I saw this Loopy Jewel ring! 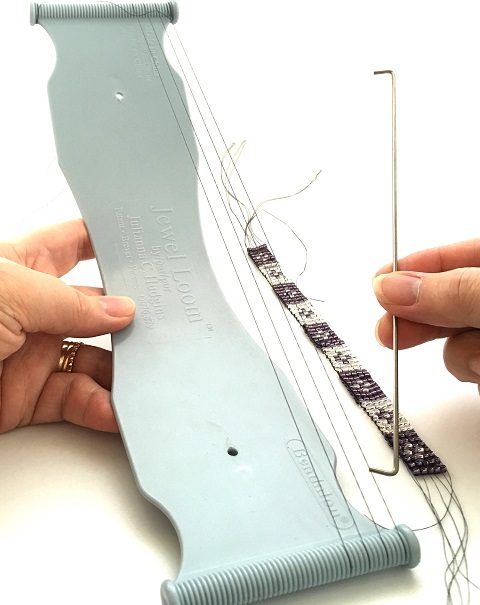 The loom can be used with beads as small as 15/0. Non-beaders will be intrigued to see how the loom can be used to create wire designs. The warp “threads“ for the Goddess amulet design are actually strands of craft wire. This makes the design strong so it can serve as a firm foundation for additional embellishments. Clever way of making the warp wire ends look like a fringe! The Swarovski Crystal brooch project shows how using wire wrap threads can support a number of large beads. The Inspiration Gallery section was outstanding. They show the enormous potential of this simple tool. Some of the designs include a fringed lampshade and a beaded embellishment for a jacket. Shown here are two of my favorites. The book is an excellent companion to the Jewel loom. It covers all the basic instructions needed to get started. The easy and quick projects definitely sparks creativity. The potential of the tool is only limited by one‘s imagination! If you'd like to win a copy of Jewel Loom please make a comment below. Make sure you leave contact info below if you do not have an online shop or blog. It ends in a week's time at 6 pm EST Monday, February 15, 2016 . I will pick the winner randomly and announce the results as soon as possible after. So be sure to leave a contact email if you don't have an online link or make sure you come back and check! Otherwise I will redraw in a week. Good luck! wow those are really neat patterns. I would love to win that book. I have a jewel loom and and a larger loom as well, and I think I hear them calling my name to start putting them to work, lol. Pearl thank you again for sharing a book that adds another dimension to jewelry making. I bought this loom a month ago to explore but felt overwhelmed and at a loss as to where to start. I would love to win this book to push me into the right direction. Thank you again! I love loom work in all its forms! This is truly an interesting style to weave on. Love the look of the wire cuff and crystal brooch. This looks like fun and the loom design is clever. I first got started in beading through loom-weaving. Thanks for sponsoring this giveaway. I have never seen this loom and it looks fantastic! Would love to have a book for inspiration as I'm definitely buying the tool! As a teenager, I made a loom from two combs and an empty chocolate box. Many years later, this would be a vast improvement! Wow, this book has so many beautiful and varied projects. I would love to own this book! The portable loom is also a fantastic invention. Everyone in my bead group wants on of them. Interesting giveaway! Somethinh new to learn about! This is something I could really get into! Looks like a new skill I would love to learn! I recently started using my bead looms again after a long hiatus & am creating new designs. This book would inspire me to make beautiful new pieces. As always, Pearl, thanks for everything you do for the beading community. I look forward to each blog post & follow you on Facebook. What a lot of beautiful projects! Would love to win! My daughter and I love making jewelry. She has such amazing ideas. This book would be great to have. And the pictures of all the work is amazing! I love the bracelets. My daughters favorite color is purple. I'm hoping I can make one similar for her. Sorry I forgot my contact info. It's amyr875@gmail.com. blog subscriber-I have a Rick's loom and a homemade 3 foot loom. love to get new ideas for using them. This is exactly what I've wanted to get, going to look this up. Thanks for the information and giveaway! I have always looked forward to learning beads on loom. Thank you for this opportunity to win the book. Oh my goodness! That last wire cuff is gorgeous! Just came back from Tucson and took a bead loom class from Julianna. The loom is inexpensive, easy to use and the book is wonderful. We made an awesome bracelet! I did not buy the book as I already had to much to bring home on the plane. I would love to have it though. I did my first bead loomed bracelet on the Jewel Loom. It's not like I need another hobby, but the experience gave me a new one. Would love to win her book. I would so love to win this. I have been wanting to buy a loom and learn how to use one for the longest time now. This would be the best birthday present since yesterday was my birthday. I have this loom and love it. I would love the book because there are projects I never dreamed were possible. Amazing wire work! Would love to win that book, I like doing loom work. Thanks for sharing. I have just recently purchased the jewel loom and I am itching to try it out! This book would be a welcome addition in using it- thanks for sharing! I would love to have this book. I bought a Jewel Loom when they first came out, but have never used it. Maybe having this book would inspire me to make something with it. thesauciestwench@yahoo.com Thank you for the opportunity to win such a fab giveaway!! This book looks great! I have an old wooden loom that I bought somewhere in the height of my jewellery-making days in my early teens and I'd love an excuse to get it out again! Oh my this is what I would love to learn to do!! I would be so happy if I won his! thank you! Neat loom! Love to check out this book and loom. I have always wanted to try this type of beading. This would be a good way to get started. I've seen this book before and love the colors of the finished jewelry. What an awesome inspiration! I think I must add this loom to my Amazon wish list...and maybe the book as well! Looks like great fun! I would like to try using a bead loom. When I try something new I like to get a book and I didn't realize you could use wire. The last bracelet was gorgeous. I can hardly wait to try some of these projects. I never imagined using wire on a loom. Those designs are beautiful! Put my name in the hat...I would love to win the loom and the book. I already have some wire so I'm itching to get started! There are some great projects in this book. I've had my eye in this for a while. Been waiting to see if you would review it. It sounds "Derin" proof! I love working with wire and beads and live the idea of marrying the two in a loom. What a great giveaway! Interesting book..Thanks for the chance to win this.. I just bought a loom and have made 2 bracelets so far I have had fun using the loom and the book would be great to have - it has some great projects in it! Great giveaway ....again!! This is very cool, count me in as well. Thank you. I have had a similar loom for many years. I bought it when Aleene's Creative living show was aired in Canada. Mine is yellow . haven't used it in years but held on to it "just in case" . so glad i did as looms are now popular again. so please add me to the list of potential winners for the giveaway . This is exactly what i have been wanting to try. Perfect timing. I am a blog subscriber. Those checkered bracelets are certainly pretty and I would love to learn how to make them. Thanks for the opportunity to win the book. I just bought a Jewel Loom. It looks like it will be a fun way to make bracelets. The ideas in this book look great! I can't wait to start! Gorgeous patterns - I like the use of wire on the cuffs! Very lovely jewelry. Would be excited to create. My friend makes these and they're beautiful! Would love to show her some new ideas! Thanks for the giveaway. I have had the loom for a long time. This look like it might be the ticket on learning to use it! Thanks! I have the loom and would love to have more ideas for bead loo. Enter me in the give-away. I'm also a subscriber.